I had coffee last week with Jesse Kamm who recently returned to LA with a new son and a new collection. Jesse took a hiatus from design and LA life in a cabin in Austin, Texas with her husband and newborn son for eight months but thankfully decided to come back to LA. She did some great simple pieces for Spring Summer 2011, easy and wearable. I love the tunic dresses which is mainly how Jesse got her big break a few years ago after trading one of her dresses for some of Liz Goldwyn‘s jewelry. Liz wore the dress in Paris at the eponymous Colette boutique on Rue St Honore and the rest is history. I also loved hearing about her husband Luke’s Home Grow Micro Farms business. It’s pretty amazing. They bring you your own pre-planted organic veggie garden that will grow in your backyard or balcony, full of veggies you can pick and choose according to season and month on their website. All you have to do is pick ’em and eat ’em and when the season ends and the seeds have given all they can Luke’s team will come and switch out the old box with a new one. 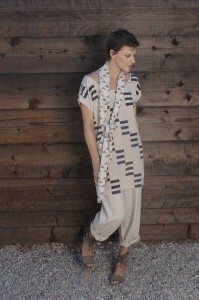 Jesse’s new line will be available at Kristen Lee’s boutique, Ten Over Six, in West Hollywood. And in tune with the local organic ethos of the whole family, everything is grown and made locally, designed and manufactured right here in LA. This entry was posted in Uncategorized and tagged Colette Paris, Home Grow Micro Farms, Jesse Kamm, Kristen Lee, Liz Goldwyn, Ten Over Six. Bookmark the permalink.